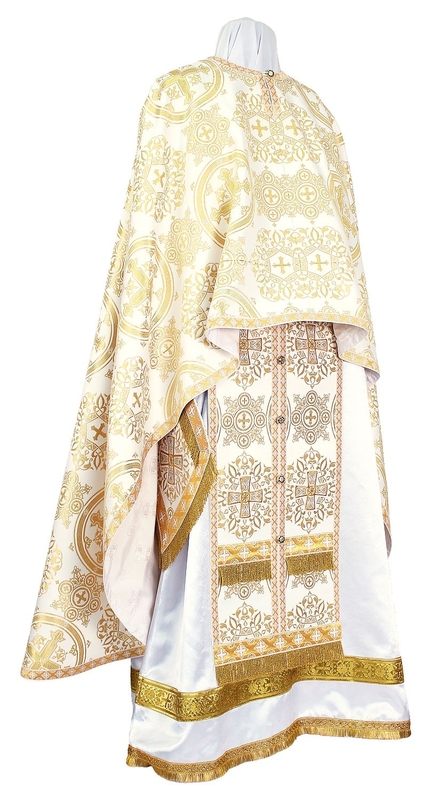 Orthodox Church liturgical Greek Priest clergy vestments (white-gold) by Istok Church Supplies Corp.
Istok Church Supplies proudly presents complete sets of white and gold Greek Priest vestments custom tailored to individual measurements. We understand that an Orthodox Greek Priest has many important liturgical duties including administering sacraments, preaching and carrying out liturgical services and we aim to enhance our customers’ reputation with our 100% authentic vestments. 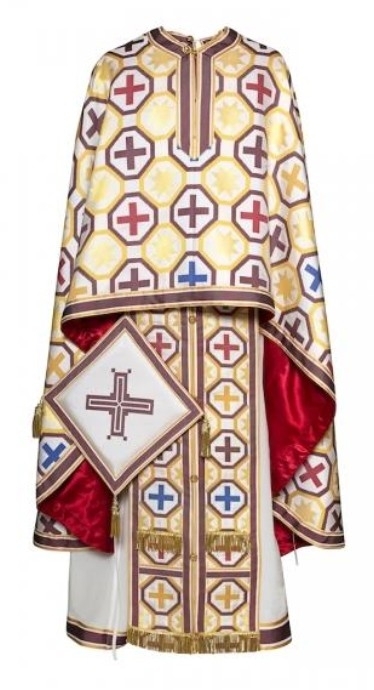 Our Greek Priest vestments in white and gold are a popular choice for holy occasions such as feasts and days honoring our Lord Jesus Christ, feasts of Epiphany, feasts of Transfiguration and many others. We make available these vestments in a wide variety of fabric choices including linen, rayon jacquard brocade, Chinese rayon brocade and metallic jacquard brocade. In addition to this, we also offer embroidered Greek vestments made with finest quality German Madeira and Gunold threads. Each white and gold Greek Priest vestment set consists of five items – phelonion, zone, epigonation, epimanika and palitsa. We provide natural rayon lining for added comfort. Customers have the freedom to choose a particular vestment in another fabric in the same price range and can add natural velvet inserts to their order. Customers can also add matching chalice covers, a veil and select from various options for an embroidered icon that will be stitched at the back of the garment. Decorations enhance the value and effect of a liturgical vestment. We offer three types of adornments – standard, premier and luxury. Our standard decoration includes inexpensive galloon and plain crosses. Premier adornment means high quality galloon and rich looking crosses. Luxury style encompasses top quality solid jacquard galloons and exquisite hand embroidered crosses. The Greek Priest vestments we offer are custom crafted by our master tailors in Europe who pay close attention to detail and provide best quality workmanship. We request customers to send in their individual measurements according to our online measurement chart and place orders well in advance if they wish to wear them for a particular event.